Ithilien, Pt. 3 ~ "I Need You on My Side"…. 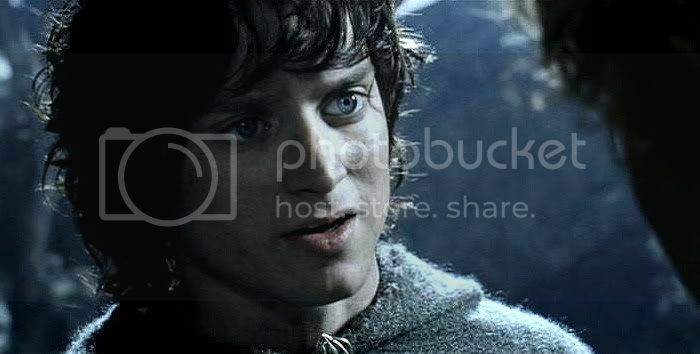 This scene continues to develop the strained relationship between the "troubled trio" (Frodo, Gollum, and Sam), which was set up in their first scene together, in TTT. In the Emyn Muil, although Gollum has attacked the two and is presented as a ne’er-do-well, he is nevertheless depicted as miserable and pathetic. Audiences feel sorry for him. After Sam's unprovoked, brutal attack on him, all the more do they warm to Frodo's show of mercy and kindness towards their captive. 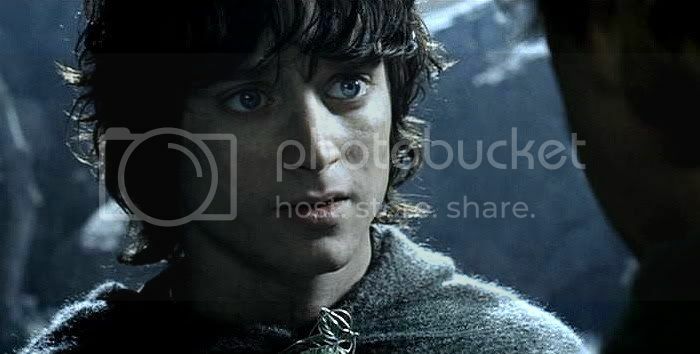 In the Dead Marshes, Frodo is shown developing a deep sense of identification with Gollum. Gollum's pulling him from death by drowning in the haunted waters of the Marshes adds the dimension of gratitude to that identification. 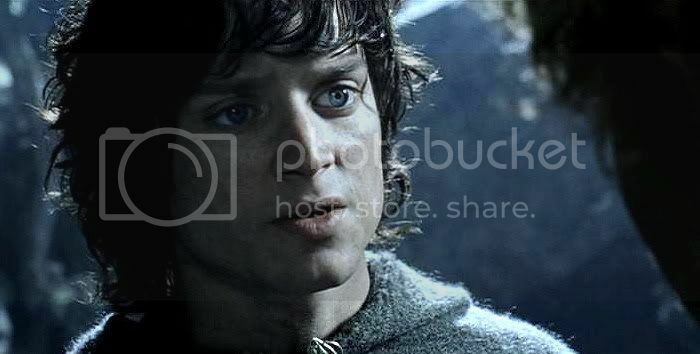 At the Black Gate, Sam is shown protesting, shaking his head, deeply troubled at Frodo taking Gollum’s advice over his. In the next TTT scene the three of them are shown walking south through Ithilien. The depiction of their strained relationship is further reinforced, Frodo again standing up for Gollum in the face of Sam’s steady antipathy. 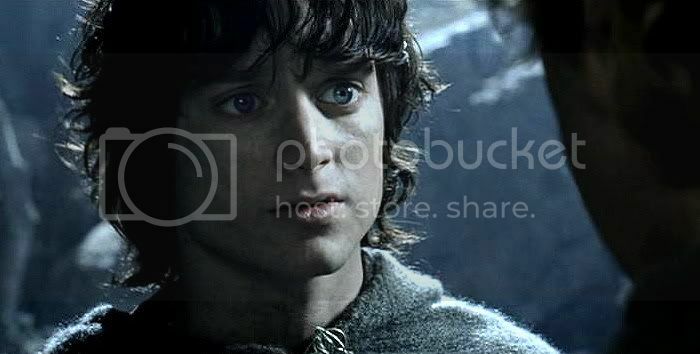 This time Frodo is the edgy, temperamental one, Sam the voice of reason. 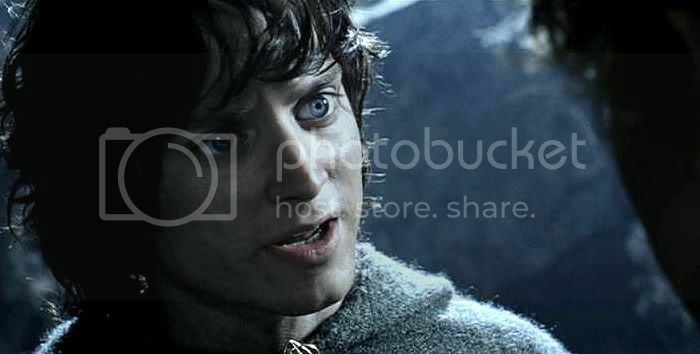 But Frodo's outburst is instigated not only by Sam's statement that Gollum can't be saved (implying that Frodo's own future is without hope), but by Sam's pointed remark about the Ring. 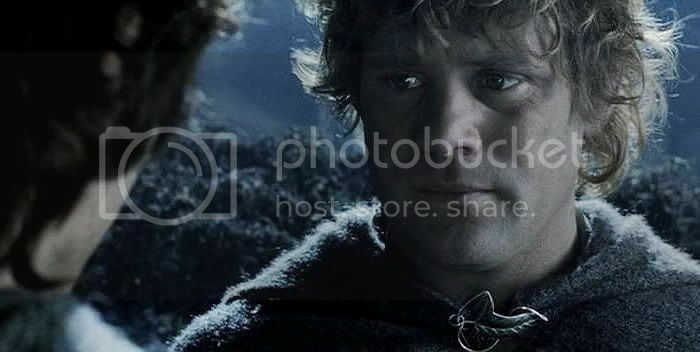 Sam quietly points out Frodo’s growing fixation with the Ring, and Frodo is so upset he actually stalks off. I didn't cap this scene, but I did post the screenplay for it here for reference. After the tiff in Ithilien comes the trauma of Henneth Annun, the madness at Osgiliath, then the calmer EE scene of Faramir's farewell to the hobbits before they enter the sewers of Osgiliath. For Frodo and Sam, TTT actually finishes up on an up note. As they walk through the woods reconciled, light-heartedly they trade remarks about being in the “Great Tales”. 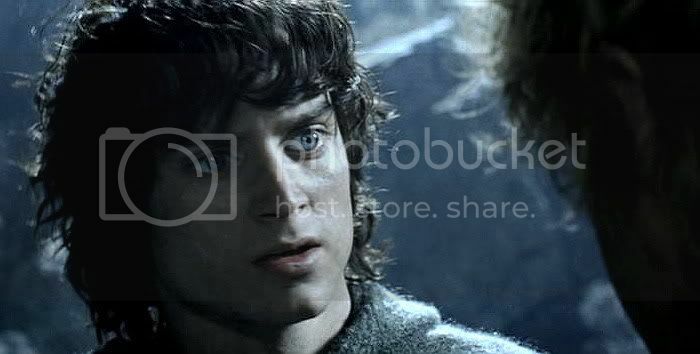 But the optimistic mood of their exchange is tempered by the sense of foreboding created as the depth of Gollum's desire for vengeance and the Ring is revealed. As they chat convivially, Gollum/Sméagol is shown by himself, in turmoil, finally deciding to deliver Frodo to Shelob and death. The same dichotomy (between lightness and foreboding gloom) is underscored by the final image of the hobbits tramping off through the woods, the camera lifting to reveal the darkness and terror of Mordor beyond, all jagged mountains, fire, and a wraith-swept roiling sky. It's a brilliant visual metaphor for where they are heading, physically and psychologically, once the story gets to The Return of the King. I think it's one of the best moments in TTT. The score is wonderfully, beautifully moody and foreboding, too, until it gets to Gollum's Song (the performance of which spoils the mood for me). The excellent RotK scene capped below recapitulates the dynamics seen in TTT, but it is not exactly the same. This time the audience is aware of Gollum’s murderous plans. And while they might not like Sam’s physical brutality towards Gollum any better than they did in TTT, at least they can find it more justified, knowing that Gollum is actively plotting Frodo’s death. 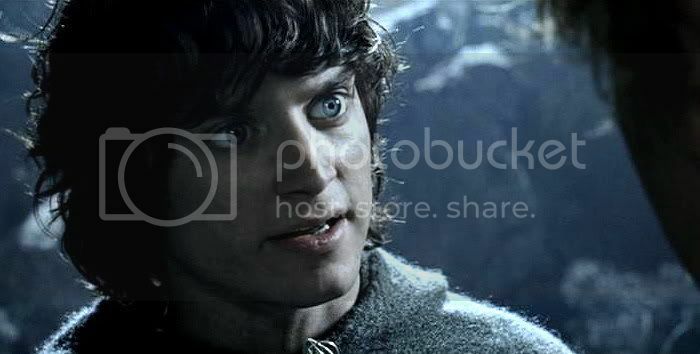 As for Frodo, he shows very well in this scene. 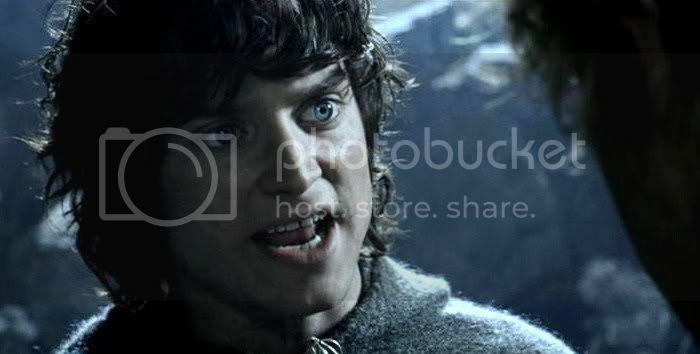 He is not like the testy, emotionally unstable hobbit he was in the "You can't save him, Mr. Frodo" scene from TTT. Here he’s a rock; still capable of clear thinking and sound prioritizing. Gollum might be plotting to kill them, but Frodo is right in saying they need him. Even with the shortened distances used in the films, the expanse, strangeness, and difficulty of the terrain Gollum is leading them through comes across to viewers. It’s clear the hobbits would not be able to reach their destination without a guide as good as Gollum. Frodo is not being sentimental or benighted in this scene. 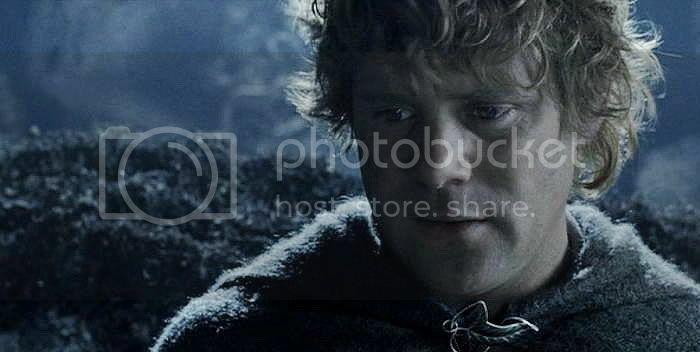 Nor is he saying Sam is wrong to be alarmed and suspicious, or that Gollum is trustworthy, only that Sam mustn’t drive Gollum off, because they need him. Book scene: a collage of book excerpts showing Sam and Frodo’s thoughts about Gollum, from The Journey to the Cross-roads. Gollum has told them they now must hide during the day. The hobbits, tired, insist on resting before they begin the night march. Gollum reluctantly agreed to this, and he turned back towards the trees, working eastward for a while along the straggling edges of the wood. He would not rest on the ground so near the evil road, and after some debate they all climbed up into the crotch of a large holm-oak, whose thick branches springing together from the trunk made a good hiding-place and fairly comfortable refuge. Night fell and it grew altogether dark under the canopy of the tree. Frodo and Sam drank a little water and ate some bread and dried fruit, but Gollum at once curled up and went to sleep. The hobbits did not shut their eyes. It must have been a little after midnight when Gollum woke up: suddenly they were aware of his pale eyes unlidded gleaming at them. He listened and sniffed, which seemed, as they had noticed before, his usual method of discovering the time of night. Gollum dropped at once from the branches of the tree on to all fours, and the hobbits followed more slowly. The red glare over Mordor died away. The twilight deepened as great vapours rose in the East and crawled above them. Frodo and Sam took a little food and then lay down, but Gollum was restless. He would not eat any of their food, but he drank a little water and then crawled about under the bushes, sniffing and muttering. Then suddenly he disappeared. ‘Off hunting, I suppose,’ said Sam and yawned. Sam and Frodo sleep quietly, but Gollum is talking to himself, split between Gollum and Sméagol. Gollum: Shhh! Quiet! Mustn't wake them! Mustn't ruin it now! Gollum: What's it saying, my precious, my love? Is Sméagol losing his nerve? Sméagol: No! Not! Never! Sméagol hates nasty hobbitses! Sméagol wants to see them…dead! Sméagol: It's ours! Ours! We must get the Precious! We must get It back! Sméagol: We lead them to the winding stairs. Sméagol: Up, up, up, up the stairs we go, and then we come to the tunnel. Gollum: And when they go in, there's no coming out. She's always hungry. She always needs to feed. She must eat. All she gets is filthy orcses. Gollum: No, not very nice at all, my love. She hungers for sweeter meats. (Sam is shown waking, then listening.) Hobbit meat. And when she throws away the bones and empty clothes, then we will find It! Sméagol: Y-es, we meant—we meant for us. Gollum: Ah! No! (Calling out.) Master! Sam: I heard it from his own mouth; he means to murder us! Gollum: Never! Sméagol wouldn't hurt a fly! (Sméagol, having put his hand to his head sees blood on it and cries out.) He's a horrid, fat hobbit who hates Sméagol, and who makes up nasty lies! Sam: He called me a liar! (To Gollum.) You're a liar! Gollum: (Cowers behind a tree.) Ah!! Frodo: (Turning Sam to face him.) If you scare him off, we're lost! Sam: I don't care! I can't do it, Mr. Frodo! I won't wait around for him to kill us! Frodo: I'm not sending him away. Sam: You don't see it, do you? He's a villain. 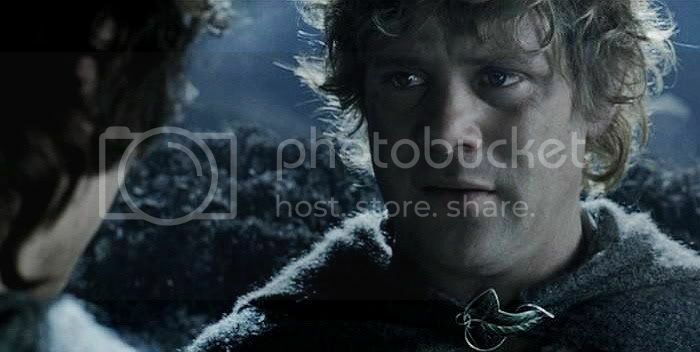 Sam: I am on your side, Mr. Frodo. The caps below (tweaked as usual) include some very beautiful portraits of Frodo. I have wondered whether Alan Lee* didn't work from an image from this scene in order to make his fine End Credits portrait of Frodo. The resemblance is very close, I think (see my icon for comparison). * Note: I just learned that the RotK end credit portraits are probably not Alan Lee's drawings, but screencaps photoshopped to look like his pencil sketches. I really like this scene; I think it works really well for all the characters (I especially like that last look that Sam gives Gollum!). Frodo: (Turning Sam to face him.) You’ll scare him off! We're lost. I've always heard this as "If you scare him off, we're lost," but I've never turned on the subtitles to see if I'm right -- not that the subtitles are always correct, mind. Bunnie, thanks for commenting. 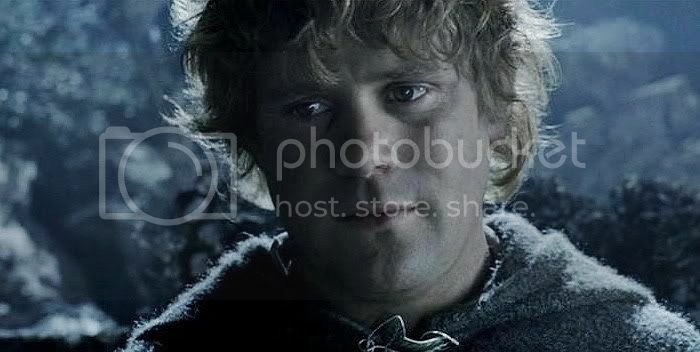 I actually have been working from a draft of the film I found on the Internet, and I don't think it's based on the subtitles in the closed caption version (those have mistakes, too, as I found out watching FotR with my semi-deaf mother). 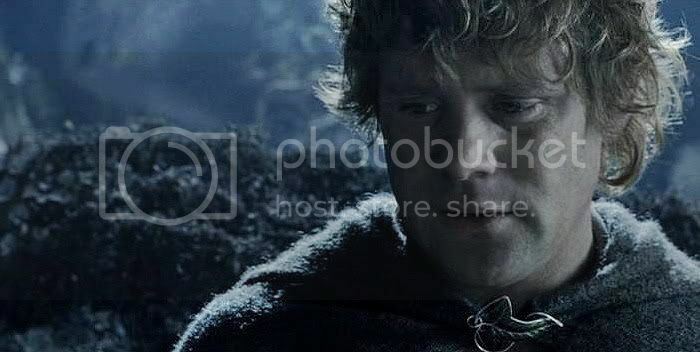 I couldn't quite tell what Frodo said at the beginning of that remark so I didn't change what the internet version said at that point (I have changed it in other scenes when I could see/hear clearly that they were wrong). But I actually think your hearing of the line is the proper one. If you don't mind, I'm going to change the script above according to your observation. I love all the things you love in this scene, but also the part with just Gollum. I think it shows the filmmakers' most brilliant work on Gollum. Every time I watch his conversation with his reflected self I marvel at the ingenuity of the actor, the director, the CGI people, the set and lighting people, everybody. It's perfect. For instance, the droplet of spittle hitting the water: such a tiny detail, but so perfect. "I have wondered whether Alan Lee didn't work from an image from this scene in order to make his fine End Credits portrait of Frodo. The resemblance is very close, I think"
I think you're right! Not only Frodo, but the Sam portrait looks as if it came from this scene too. The Sam portrait, too? Good thought! I'll have to find the Lee drawing and do a side-by-side. Thanks, Primula. Awesome screencaps and commentary as usual, Mechtild. Thank you. 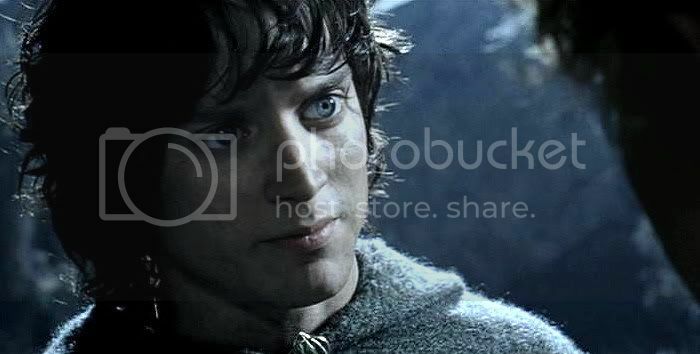 Regarding the portrait of Frodo used in the end credits, tgshaw (Trudy) wrote an essay about that which I remember reading on her website. I found it in the archives and will post the link here (if it's not okay...just delete it). It is an interesting read as I initially did not like the portrait either. Shelbyshire, thanks so much for that link. I have a note in to tg asking if I can link it in the body of the post, and maybe post a separate notice for it. I love what she wrote about Frodo in that essay, inspired by the contemplation of that picture. Go, tg! 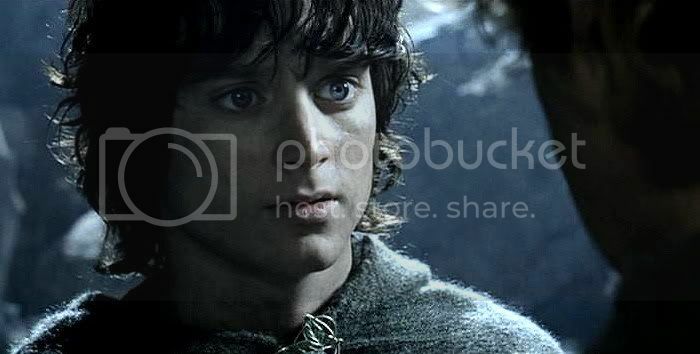 I don't know if it's the light, the intensity of the gaze, but I think that Frodo never looked more beautiful than in that scene. And it's more evident in your screencaps. You're welcome, Melyanna. 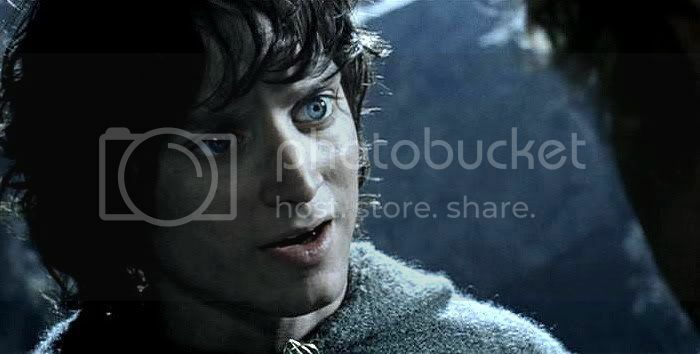 Yes, Frodo is magnificent in these screencaps, and wonderful in this scene. 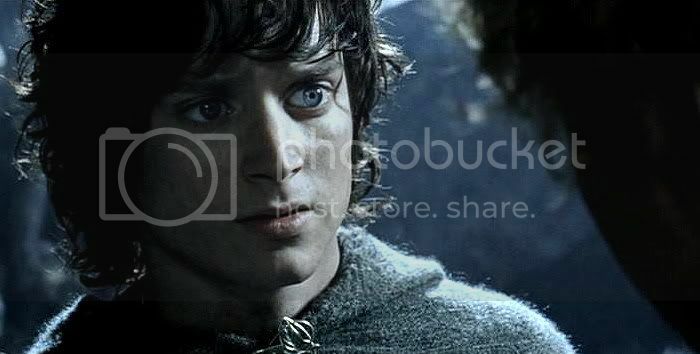 ... and Frodo does look so very beautiful in it, too! Me, too! I agree, Pearl. It really is a scene that served both the film and Tolkien's story well. Just excellent. Thanks for that wonderful post, Mechtild. This scene is just perfect - the actors, the mood, the CGI. Yes, I hope Trudy/tg allows me to do an ad for her entry. I so liked what she said. 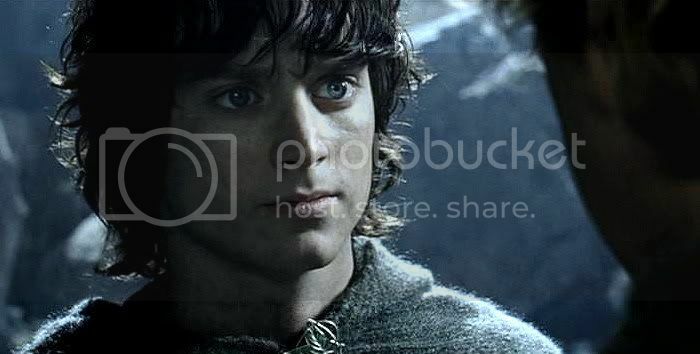 It reminded me of how Frodo himself was described as a clear vessel through which the Light could be seen. 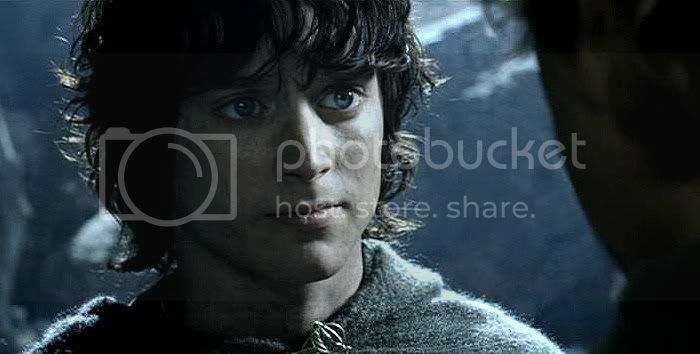 In a way, her essay told how the end credit portrait served as a similar vessel, through which book Frodo could be seen--but allowed to do so in its not looking exactly like film-Frodo. I think both Frodo and Sam see the necessity of using Gollum as a guide. 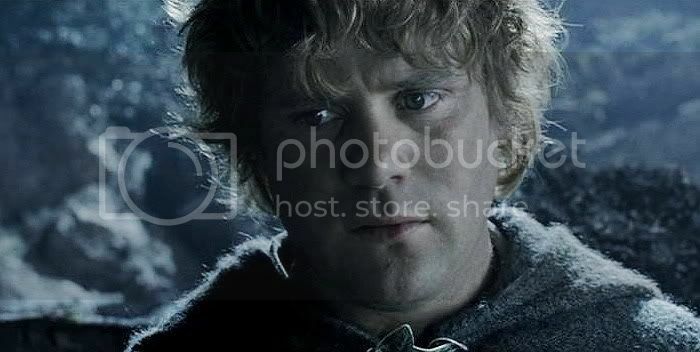 But Sam's loyalty is first to Frodo and second to the quest, so his fears and distrust are at the forefront. And Frodo feels empathy because he understands the toll the Ring extracts from its wearer and perhaps sees his possible future in Gollum. 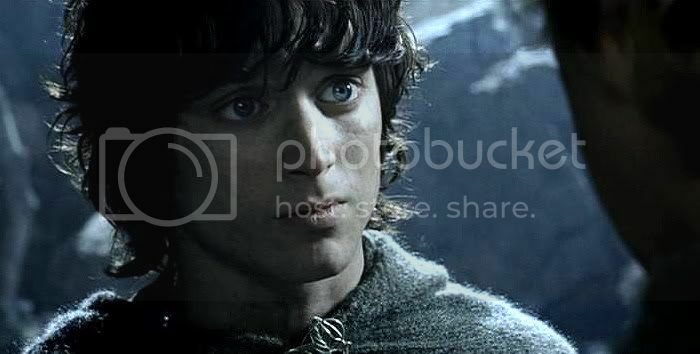 Of course, one of Tolkien's themes was the virtue of compassion; ultimately, both Frodo and Sam show compassion toward Gollum (in book and film) which results in the fulfillment of the quest. I don't think the Sam portrait is from TTT, by the way. I think it's in ROTK when Sam says that he doesn't think there will be a return journey, but I could be wrong as I am writing this without checking. Hello, Cookiefleck. Thanks for the well-thought out reply. I don't think anyone said that Sam's end credit image was from TTT, did they? I had better go back and check what people said. I thought someone said that his portrait was from this same scene. But I haven't found the cap yet. Perhaps you are right that it is from the waterskin scene. 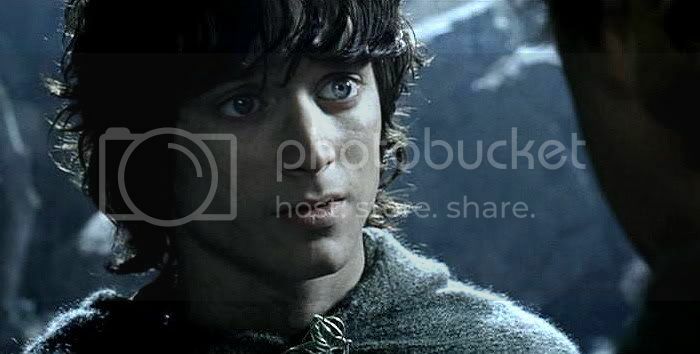 I did cap that (yet to be presented), but, focussing on Frodo, I seem to have missed the pertinent Sam cap. 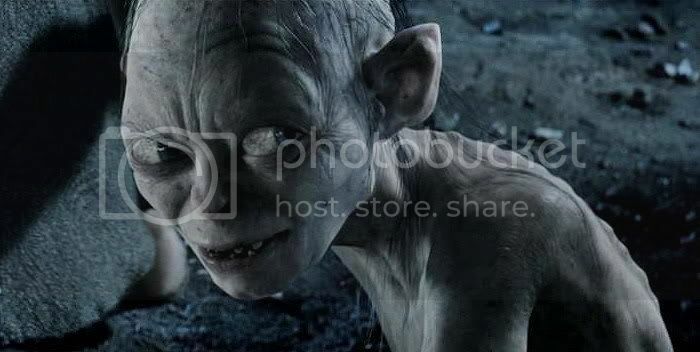 You thing Sam showed compassion towards Gollum in the film? When was that? I know when it was in the book, well, I know when the most important instance of his compassion comes, on the slopes of Mt. Doom when Frodo has walked on ahead, Sam left to deal with Gollum, and in a position to kill him. But when is it in the film? My brain is all befuddled today, forgive me! My TTT cap reference was wrong.. my mind was just registering the TTT talk that preceded your discussion of the scene under discussion. 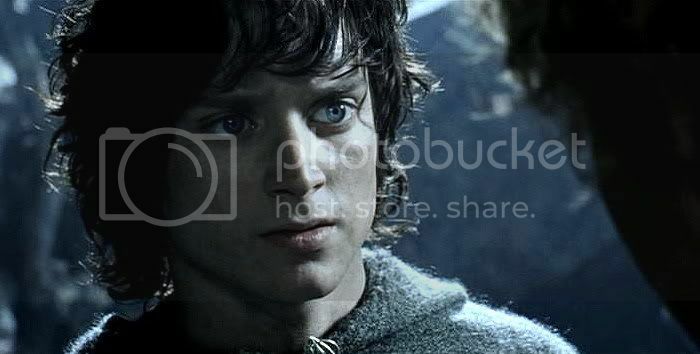 Even though his mandate is to protect Frodo and he rightfully sees Gollum as a danger ("villan") in that regard, I think that film Sam shows some compassion (willingness to treat Gollum as a "person" rather than an object of scorn) in several instances - as they are taking their leave of Faramir, for example. Book Sam's main moment of compassion comes on the slopes of Mount Doom, as you said, clearly delineated by Tolkien. In the film's version of that scene, he similarly has an opportunity to kill Gollum, sword drawn, but doesn't. I have capped the fight outside Mt. Doom (EE version) and will present it eventually. 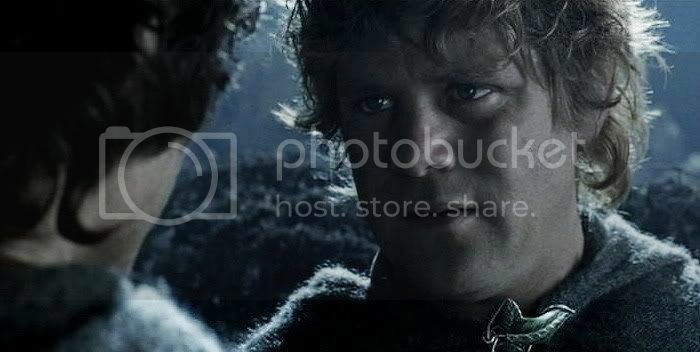 My take on the film moment when Sam spares Gollum is not that he has compassion on him, but that he simply has ceased to think of Gollum at all. 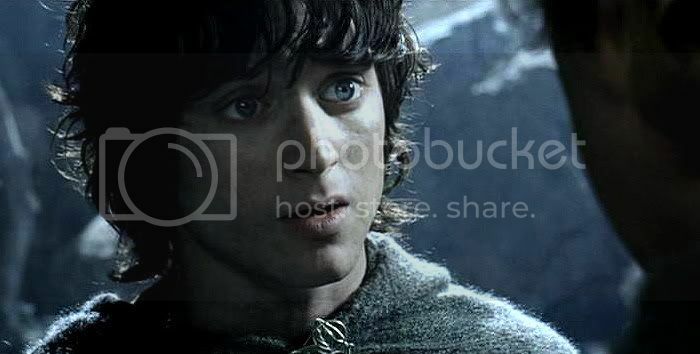 After Sam swipes him with the sword point and Gollum falls back in pain, Sam is shown immediately looking up,looking for Frodo. Seeing Frodo is far ahead at the entrance to the Fire, Sam takes off at once without a backward glance at Gollum. That scene still gives me chills! It was a masterful way to end the film. Me, too, Shirebound! I just love it. And the music, with those sonorous, spooky-but-beautiful "Ooo-ooo-ooo"s is so perfect. Anyway, on a serious note, I think you're absolutely right in that we DO warm to Frodo for showing him mercy and not allowing Sam to hit him and be mean to him. It's the flared nostrils. ;) Seriously! He gets a wonderfully "righteous anger" look on his face when he's riled.